Photo credits to Des Moines Register. As candidates like Kamala Harris participate in town halls on national television and contenders like Amy Klobuchar are already fielding negative press about her brutal management style, the primary season for Democrats has hit the ground running. 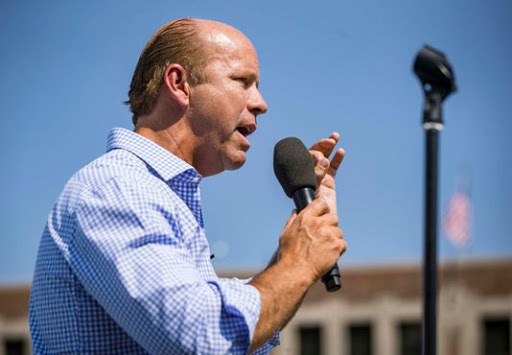 But for one candidate, the former US Representative for Maryland’s 6th congressional district, John Delaney, the race started two years ago, when he announced in 2017. In what is now his second largely self funded bid for POTUS, Delaney has been the longest running candidate… yet according to multiple websites, he has one of the lowest tracking poll numbers. With a net worth of $93 million, Delaney is one of the richest members of the House of Representatives, and is “almost entirely turning to his personal fortune to hire staff, book TV time, ad rent space in towns across the country for campaign offices,” according to CNN. The benefit of time and wealth has allowed him to visit Iowa almost three dozen times and familiarize himself with all 99 counties in the past few years, as well as establish campaign centers both there and in New Hampshire. But despite his head start, Delaney still falls far behind several of the established names already in the public spotlight that are considering or have already announced their run, such as Senator Elizabeth Warren, Senator Bernie Sanders, and Former Vice President Joe Biden. Delaney is not the lone longshot candidate. Candidates like Rep. Tulsi Gabbard, nonprofit-founder Andrew Yang, and a 37-year-old mayor from South Bend Indiana, Pete Buttigieg, are all less familiar candidates that have gained plenty of national traction, as well as minorities in a party that has repeatedly indicated its desire to see diversity that transcends the typical politician model that Delaney fits to a tee: the rich, straight white male. In that respect, Delaney was recently joined by Beto O’Rourke, yet after a contentious senate race in Texas last year, O’Rourke has a much stronger national profile to back him up. To overcome these obstacles, Delaney appears to be using two approaches. The first is spending more time on the campaign trail and in the homes of Americans, with Delaney telling Rolling Stone earlier this month that he has to beat the more familiar faces “ the old-fashioned way” which is by “working harder on the ground and meeting with voters in Iowa and New Hampshire.” The second entails putting more money into his campaign. Despite having been in the race the longest, Delaney has yet to reach the threshold of 65,000 separate donations from 20 different states that would get him into the first 2020 DNC debates. To combat this, Delaney has introduced an unconventional fundraising tactic, and offered everyone who donates one dollar to his campaign a two dollar donation to the charity of their choice, tacking on more bills to an already expensive campaign. According to the Federal Election Commission, Delaney has already loaned 4.5 million to his campaign, and according to Fortune, which surveyed strategists, fundraisers, consultants, and historical record in 2015 during the Republican primary, startup costs run up to 10 million (to set up headquarters), and the Iowa and New Hampshire primaries can demand $8 million to $10 million and $12 million to $15 million, respectively. Inevitably, that number gets even higher by the time the general election comes around, with President Obama spending $750 million in 2008 and around $1 billion in 2012, and the 2016 election running up to $2.4 billion for both candidates combined. With the power and significance of money as entrenched as it is in our election system, and the 2020 pool being as crowded as it is, the decision to run for the highest office in the land begs the question about the value of being a “Democratic Don Quixote,” and running an expensive campaign that according to all objective indicators, may not pay off.